Heat oven to 350°F. 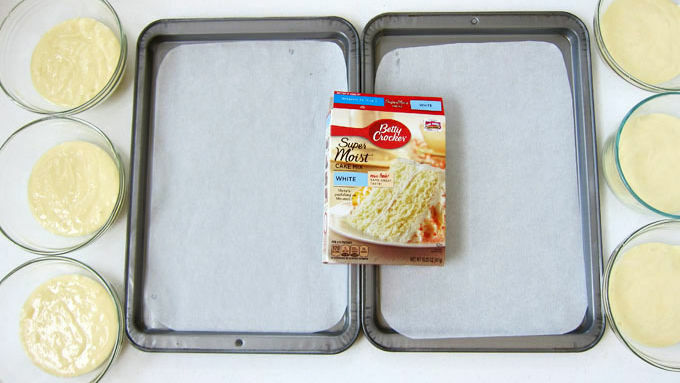 Line two 15x10x1-inch pans with cooking parchment paper. In large bowl, beat eggs with electric mixer on high speed until thick and lemon-colored, about 6 minutes. Add cake mix, sour cream, water and oil. Beat on low speed 30 seconds, then on medium speed 1 minute. Divide batter into 6 small bowls, about 3/4 cup batter per bowl. Add red, orange, yellow, green, blue and purple gel food colors, one to each bowl; mix. 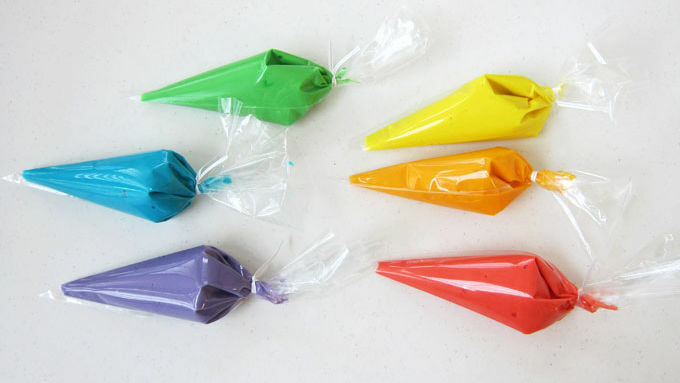 Pour each colored batter into a decorating bag or resealable food-storage plastic bag, and cut one corner off each bag. 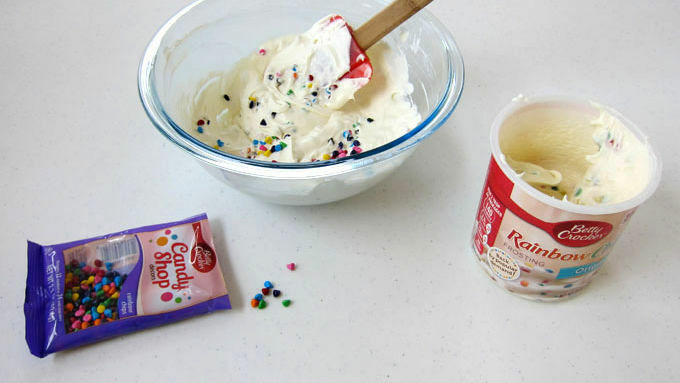 For better control with cake batter, be sure to cut small opening on end of each resealable bag. 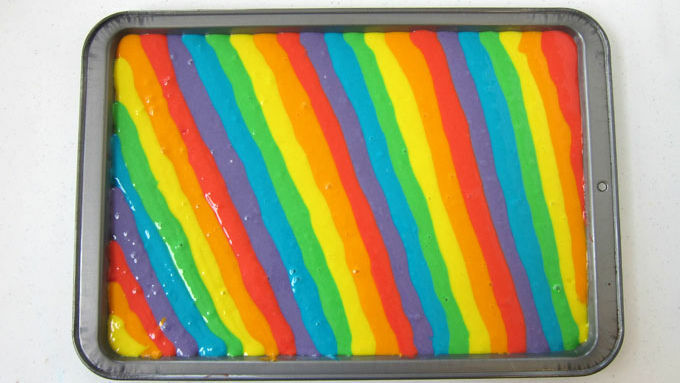 Starting with purple batter, carefully squeeze a thin diagonal line of colored batter onto each pan; repeating with blue, green, yellow, orange and red to make a rainbow-striped pattern. Continue until all batter has been used and pans are equally filled. It's ok to leave small spaces in between colors, as batter will fill in during baking. Bake 8 to 10 minutes or until top springs back when touched. Meanwhile, sprinkle powdered sugar over two clean kitchen towels. Remove cakes from oven. 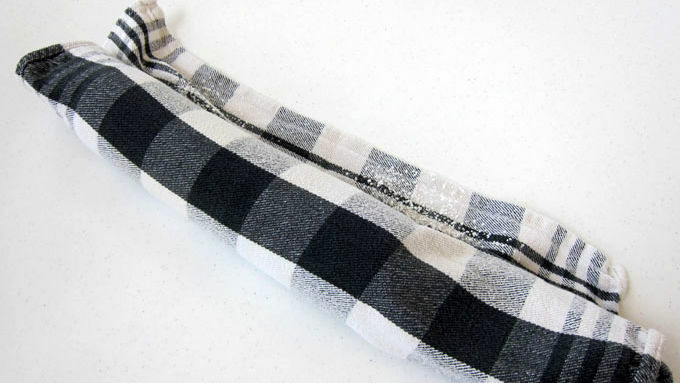 Run metal spatula around edges of pans; carefully turn one on to each kitchen towel. Peel away parchment paper. 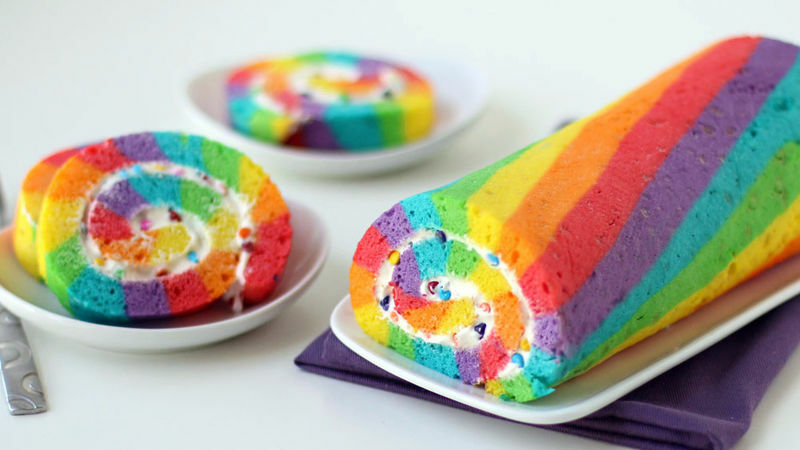 Immediately roll up cake and towel from narrow end. Allow cakes to cool 30 minutes. In medium bowl, mix frosting and whipped topping. Mix in Betty Crocker™ Candy Shop decors rainbow chips, if desired. Carefully unroll cakes; spread half of the filling over each cake. Roll cakes up into logs; refrigerate at least 1 hour before serving. Cut into slices to serve. Store covered in refrigerator. When adding stripes of cake batter, it's ok to leave small spaces in between colors, as batter will fill in during baking. For better control with cake batter, be sure to cut small opening on end of each resealable bag. Want some bright and colorful cakes that will look super cool on your dessert table but won’t take all day to create? 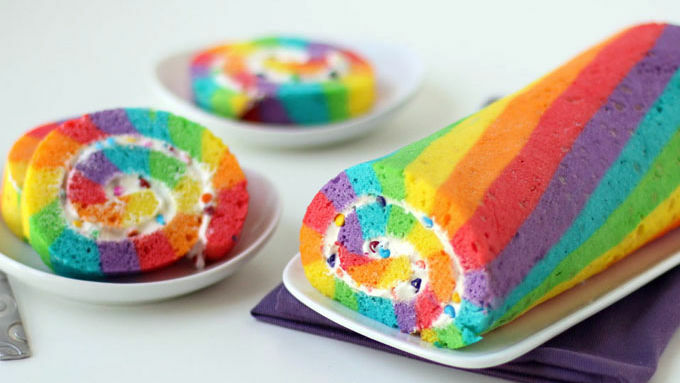 These Rainbow Cake Rolls are quick and easy to make and will really add a pop of color to your event, whether it’s a birthday party or another special occasion. Oh, and they’re easy to serve too! 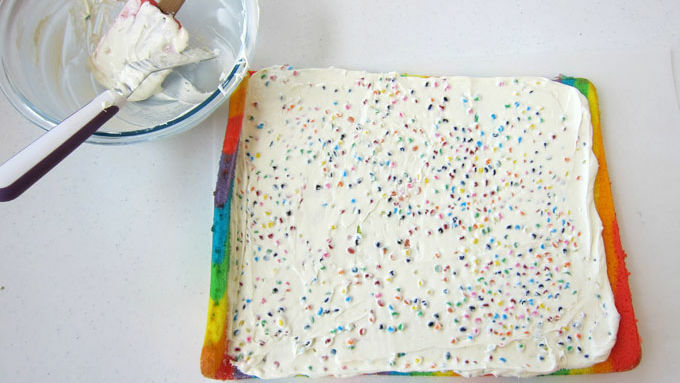 Just slice and plate and all your party guests will enjoy a festive swirl of cake filled with rainbow chip frosting. What's more colorful than that?